Apple today released a new App Store application called iTunes Connect Mobile [App Store link], designed to help developers access sales data for their applications distributed through the App Store. The iTunes Connect Mobile application allows developers to access their sales and trend data from iTunes Connect. You can now view your daily and weekly sales data related to updates, paid and free apps as well as In-App purchases. Whether at the office, at home or on the go, iTunes Connect Mobile keeps you informed about your sales numbers right on your iPhone or iPod touch. 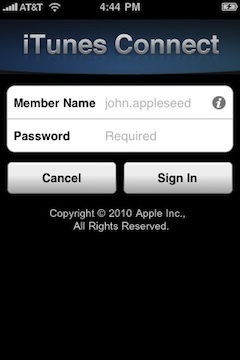 The application is compatible with the iPhone and iPod touch on iPhone OS 3.0 or higher and will also run on the iPad, although not it is not a universal application and thus lacks an iPad-specific interface. iTunes Connect Mobile marks Apple's sixth official iPhone application, joining Texas Hold'em, Remote, Keynote Remote, MobileMe iDisk, and MobileMe Gallery. The company has also released iBooks and its iWork suite for the iPad.